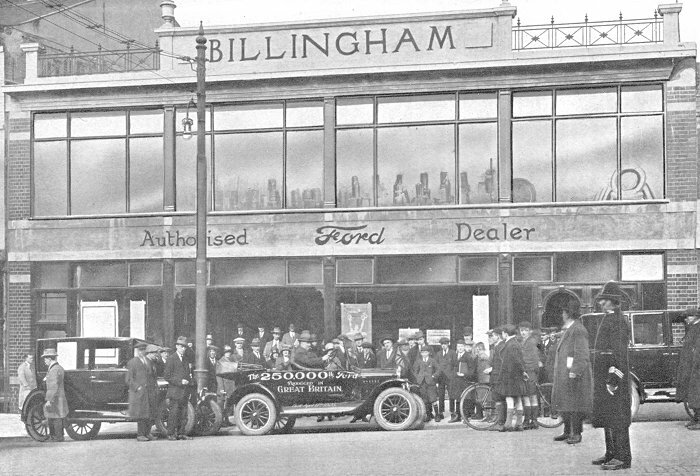 B. Billingham Limited, on the corner of Birmingham Road, and Cartwright Street, Wolverhampton was one of the town’s most well known car dealers. 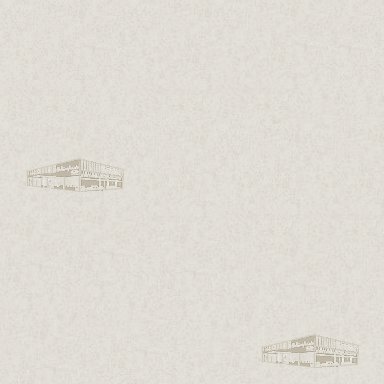 The company became the town’s main Ford dealer, and had a large modern showroom, and well equipped workshops. Benjamin Billingham began his career as an apprentice at Robert Stroud & Company, Niphon Works, Lower Villiers Street, Wolverhampton. After four years he realised that it was not for him, he was more interested in mechanics, and vehicles in particular. 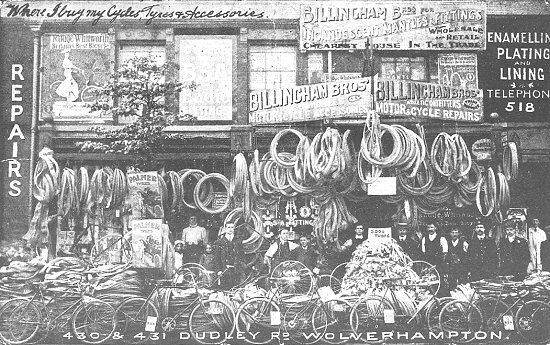 In 1900 when he was just 22 years old, his opportunity came when he joined forces with his brother, and opened a cycle shop at 430 and 431 Dudley Road, under the name of Billingham Brothers. They repaired cycles in a workshop at the rear of the premises, and stocked a wide range of parts and accessories. Unfortunately the partnership was short-lived. Ben's brother decided to return to the shoe industry at Netherton in which Ben's other seven brothers, and sister were actively engaged. Undaunted, Ben decided to carry on alone. Benjamin Billingham, the company's founder. The business was a great success. Ben stocked a vast range of parts, carried out all kinds or repairs, and built bicycles to order. He stocked many of the well known cycles of the day, and in his spare time visited cycle race meetings. Ben's wife Adelaide opened a draper's shop next door in Dudley Road which also became a thriving business, which she managed to run at the same time as rearing a family. Ben was ambitious and worked hard. In 1905 he began to sell motorcycles, and motorcycle accessories, and in 1910 the product range was extended to include cars, and cars spares. By this time he had about a dozen staff, and became one of Britain's first Ford agents. The venture was a great success, and larger premises were soon required. 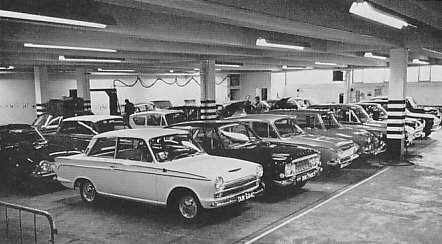 The company acquired an old building on Snow Hill, which was adapted, and modernised exclusively for the sale and service of Ford vehicles. 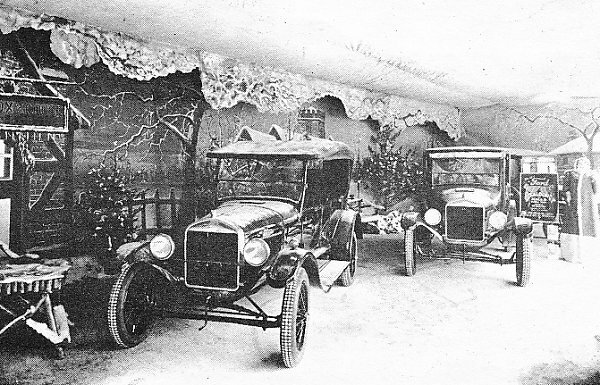 The new showroom opened in 1913, but the first few years were extremely difficult due to the First World War. Ben Billingham and his staff managed to keep the business going, but times were very hard. After the armistice in 1918, Ben lost no time in expanding the business. Billinghams became one of the first firms in the country to launch a Ford tractor supply and service scheme, in which they demonstrated tractors on the farmer’s own land, achieving early on-the-spot sales. 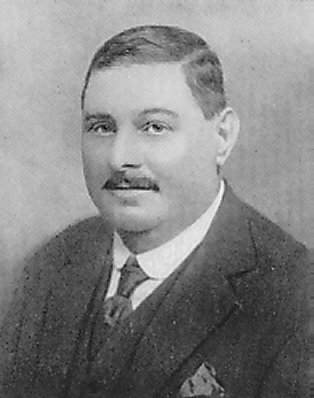 In 1921, Mr. L. R. Guy, Ben Billingham’s son-in-law, joined the company as General Manager. He was 22 years old at the time, and would eventually become company chairman. The Guy name has often caused confusion because of local vehicle manufacturer Guy Motors Limited. Mr. L. R. Guy was not related to Sydney Guy (who owned and ran Guy Motors), and had no connection with the company. Mr. L. R. Guy joined Billingham's after marrying Ben's daughter Adelaide. His other brother, Mr. J. W. Guy married Ben's other daughter, Kathleen. The Guy brothers were the sons of Mr. A. J. Guy, the Midland Refreshments contractor. 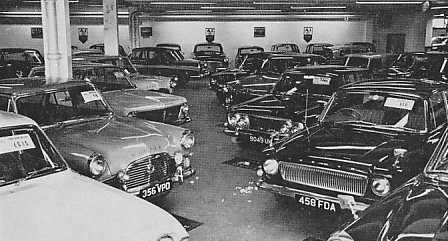 The showroom on Snow Hill. Success continued, and Billingham's soon outgrew the Snow Hill site. 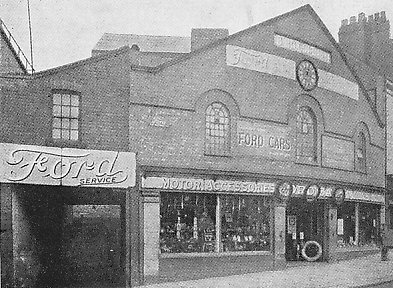 In 1922 a separate service department opened in Cleveland Street, and in 1923 the Snow Hill premises was completely redesigned with large modern showrooms. The company then concentrated on sales only. The 1920s were busy times. Thanks to mass production, car prices had started to fall. 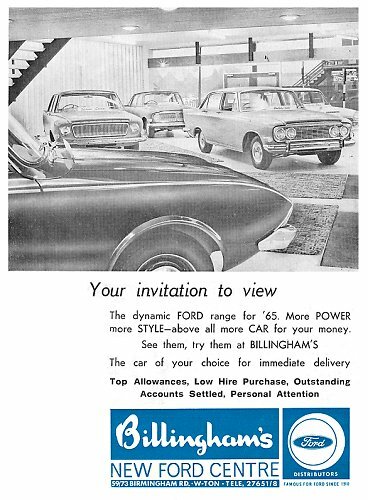 For the first time the ordinary man in the street could afford to buy a car, and so there was great interest in Billingham's and the latest Ford designs. The motoring craze had arrived, and Billingham's were busier than ever. They carried out all kinds of stunts and gimmicks to attract new customers. Billingham's became well known for their novel, eye-catching window displays, which were often designed and executed by Ben himself. 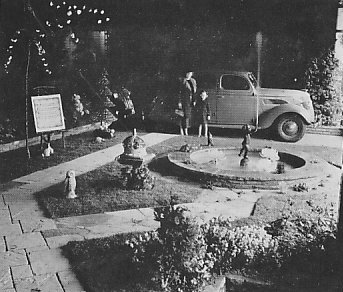 Displaying the 250,000th Ford car that was built in Britain, outside the Snow Hill showroom in 1925. The Christmas 1926 display which won the Ford Cup, the first window display to do so. An advert from 1936. Ben was forthright, honest, and not afraid to speak his mind, which could easily turn would-be friends into enemies. He enjoyed a challenge, and could turn his hand to almost anything. He sometimes joined the artistes on stage at the Hippodrome where he assisted with a conjuring act. He was an expert fisherman and had many of his larger catches stuffed, and displayed as trophies. In the late 1920s he worked tirelessly at Snow Hill, but the heavy workload took its toll. He died in 1931 at the early age of 53, having just completed 21 years as a Ford dealer. After his death a private company was formed, with Mr. L. R. Guy as Chairman and Joint Managing Director, and his brother Mr. J. W. Guy as Joint Managing Director and Company Secretary. Their wives, Ben Billingham’s daughters, Adelaide, and Kathleen, joined them on the Board. 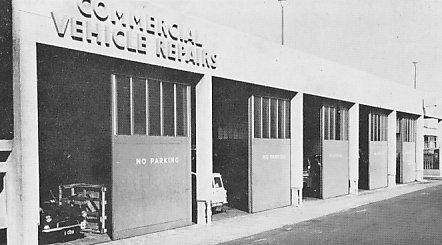 The firm continued to prosper, and in 1937 a car accessories department opened in Cleveland Street, next door to the service department. By the 1930s Mr. L. R. Guy had become a local councillor and took an active part in the civic life of the borough. In 1934 he inaugurated the town's first blood transfusion service, which was attached to the Royal Hospital. In those days transfusions were given directly from donor to patient. During the Second World War the company concentrated on vital war work which consisted of building and testing Ford V8 engines. 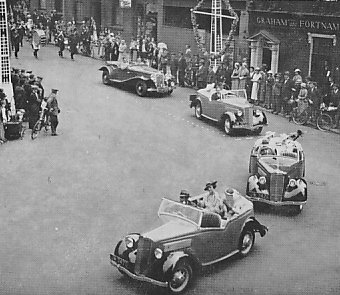 The procession to mark the Silver Jubilee celebrations in 1935, on its way to West Park. 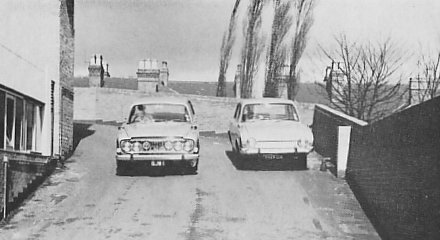 The cars were on loan from Billingham's. The window display for the coronation of George VI in 1937. 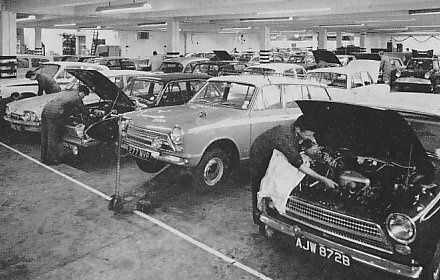 The Snow Hill showrooms became the packing department, and the service department dealt with all types of government vehicles, at a time when spares were in short supply, and ‘make do and mend’ was the order of the day. The Guy family did their full share of extra work, and still found time to participate in voluntary wartime duties. Councillor Guy was responsible for the Borough A. R. P. Transport Service (later the Civil Defence), and the vehicles that carried the emergency feeding teams to Coventry during the air raids. He also organised wartime school meals, and the volunteer transport which served military personnel who were on leave from the forces. Between 1940 and 1945 more than 10,000 V8 engines were built and tested by the firm. This was made possible thanks to newly recruited unskilled workers, who had to undergo intensive training in the shortest possible time. 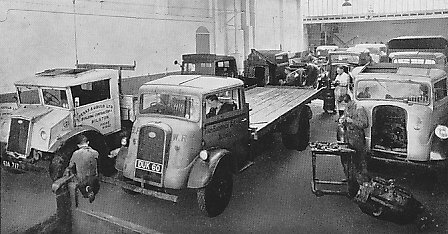 By the mid 1940s there were large numbers of commercial vehicles in everyday use, so in 1947 Billingham's decided to open a new service department in Bell Street, solely for heavy commercial vehicles. The heavy commercial vehicle servicing department in Bell Street. 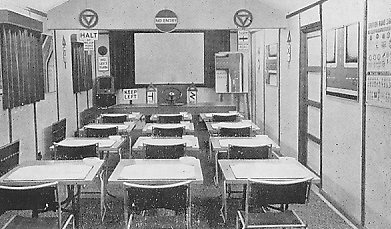 The driving school lecture room. 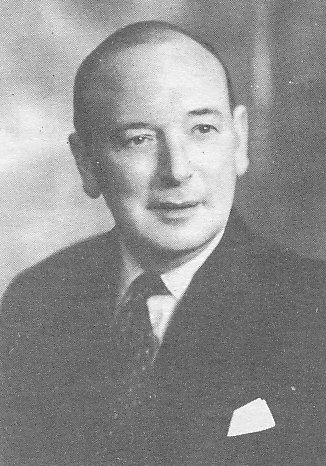 Councillor Guy was elected Mayor in 1950 to 51, Deputy Mayor in 1951 to 52, and appointed as an Alderman in 1960. In 1953, Mr. Guy’s two sons, Mr. L. R. Guy junior, and Mr. G. A. Guy joined the company, after completing engineering apprenticeships, and gaining much valuable technical experience. In 1960 Mr. G. A. Guy followed in his father's footsteps when he became a councillor. 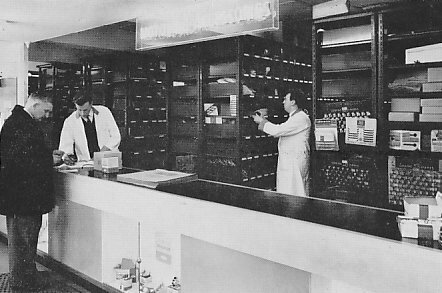 In 1954 expansion continued with the opening of a ‘while you wait’ service department in Newhampton Road. 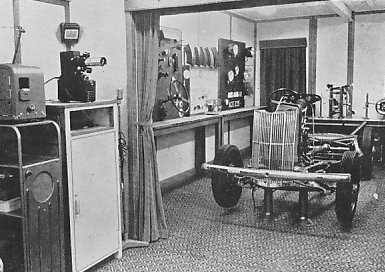 The company also ran the Billingham Modern Motoring School, believed to be the first driving school in the country to be opened by a car distributor. By the 1960s the school had fifteen R.A.C. certified instructors. The firm even had its own hire purchase finance company which operated solely for the convenience of its customers. The driving school model room. An advert from 1953. 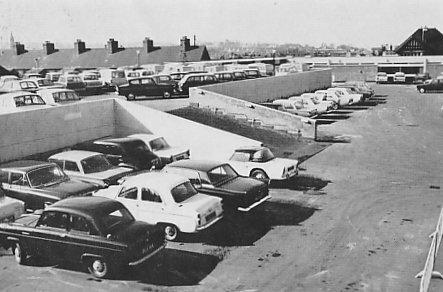 In 1956 a storage depot for new vehicles opened in Colliery Road, which was later turned into a showroom and depot for the sale of used cars. The following year saw further expansion in Cleveland Street when Billingham's acquired an old printing works next to the company’s premises. This enabled the parts and accessories department to be joined to the passenger car repair section, and the opening of an office block. The 1950s ended with the acquisition of an old factory and land in Cartwright Street, next to a piece of land in Birmingham Road, already owned by the company. It had been acquired for future development. In 1960 Mr. and Mrs. J. W. Guy retired, after 29 years as directors of the company. On their retirement, Mr. L. R. Guy junior, and Mr. G. A. Guy were appointed joint Managing Directors, and Mr. W. R. Allmark, who had been with the company since 1929 was appointed Director and Company Secretary. Also in that year the company’s capital was increased to £100,000. By the mid 1960s plans for the redevelopment of much of the town centre, including Snow Hill, Cleveland Street, and Bell Street were well underway. Billingham's sold the company’s properties in the town centre, and moved to a new building on Birmingham Road, which was built on the company’s land alongside Birmingham Road and Cartwright Street. 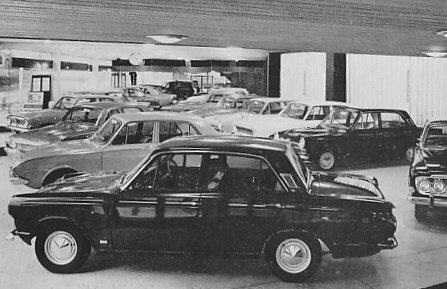 The New Ford centre was designed and built in just 36 weeks, and opened in December 1964. At the same time, the family members, who were also the shareholders, increased the company’s capital to £250,000. During the construction of the building, the directors buried a time capsule consisting of a specially made brass box which contains sales catalogues, coins of the realm, portraits of the directors, and photographs of the building under construction. It was buried in June 1964. By this time the business employed 151 members of staff. Mr. W. R. Allmark, director and company secretary. The time capsule and its burial. 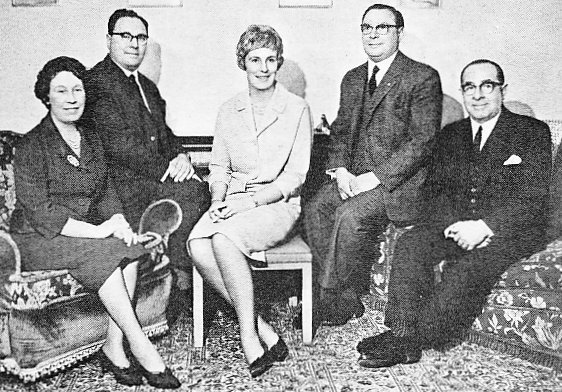 Members of the Guy family who were company directors. Left to right: Mrs. L. R. Guy, Mr. L. R. Guy junior, Mrs Anne Frost, Mr. G. A. Guy, and Mr. L. R. Guy senior. 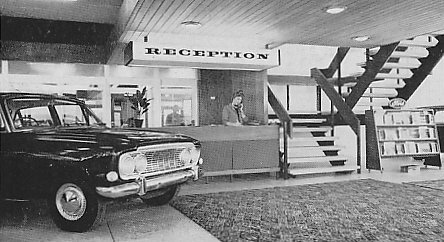 The reception desk in the main showroom. The new building, at the time the most up-to-date Ford centre in the Midlands, had 4,500 tons of reinforced concrete, 3½ miles of electrical wiring, 2,800 square feet of glass, and 50,000 bricks. 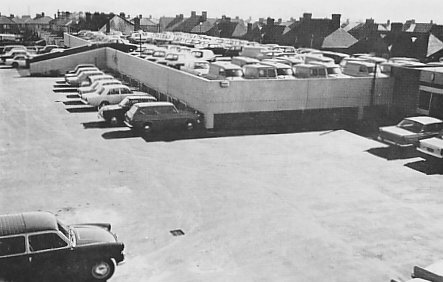 There was a two tier rooftop car park which could accommodate 350 cars, and could be reached directly from the road via two heated ramps, that were wide enough to take two-way traffic. On the ground floor could be found the new car sales department, the used car sales department, spare parts sales (retail and trade), passenger car repair and servicing bays, the commercial vehicle repair department, offices for the sales staff, the staff room, customer’s waiting room, and the heating plant. On the first floor were the administrative offices, a conference room, the directors’ suite, and the vehicle body part stores. The used car showroom. During the late 1960s Billingham's became part of S. J. & E. (Holdings) Limited. The Birmingham Road building is now occupied by Evans Halshaw. 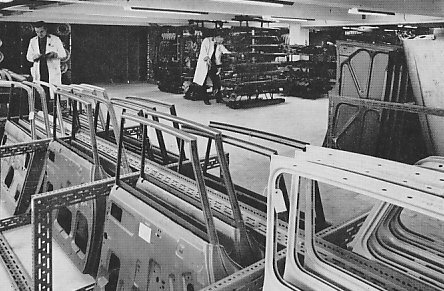 Some of the service bays. 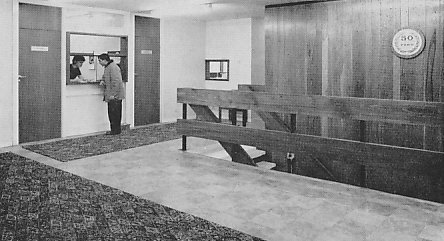 The reception foyer for the administrative offices. The entrance to the commercial vehicle servicing department. The retail spares sales counter. The vehicle body parts stores. The upper level of the car park. The heated ramp leading from the road to the car park.